I can tell when I haven’t been making enough man food around here. Jesse, my husband, starts incessantly talking about his deep love of bacon. He also requested Sloppy Joes of all things for dinner. I tend to fall into vegetarian tendencies naturally, often forgetting he grew up on a small farm with cattle. Knowing I’ve pushed my luck a bit too far I fulfilled this man food request. I’m not all that excited about this honestly. Sure it tasted great, and the homemade bun was fabulous, but my overexcited inner child is not jumping for joy here. If only this sandwich was made of beautifully grilled fresh vegetables, that would make my soul sing! My husband however, was ecstatic I made this meaty sandwich. He loved it! There’s something about many men and meat I just don’t understand. Jesse and the other males in my family get excited when meat shows up on the table. They visibly start to become more animated and announce how much they love the meal, no matter how simple. On the other hand, if I feed them quiche and chai tea, they look like I’ve beaten them and their testosterone levels appear to drop. I also realize if I don’t make these meaty man food items on occasion, my husband will try to put up with me for awhile as best he can, but will soon start knocking on neighbors’ doors begging for a good meal, all the while repeatedly broadcasting bacon to be his favorite vegetable. I’m steaming artichokes and roasting corn for lunch. I’ll likely need to redeem myself soon by making more man food for this atrocity against male nature. Add all the ingredients to the bread machine pan except flour and yeast. Top the ingredients with the flour, and put the yeast on top of the flour. Set the dough cycle and push start. When cycle finishes, turn out onto a floured board and punch down. Knead 4 or 5 times; add a little more flour as you knead if necessary to keep it from sticking. Cover dough with a clean dishcloth and let rest for about 30 minutes. Cover a baking sheet with parchment paper and sprinkle with cornmeal. Place dough shapes on the baking sheet and let rest for about 20 minutes (cover with a clean dish towel or parchment paper). Bake at 375 for about 18 minutes, or until nicely browned. Combine brown sugar and steak seasoning. Add sugar and spice mixture to the skillet and combine. When the meat has browned, add onion and red peppers to the skillet. Reduce heat to medium and cook onions, peppers, red wine vinegar and Worcestershire sauce with meat for 5 minutes. Add tomato sauce and paste to pan. Stir to combine. Reduce heat to simmer and cook Sloppy Joe mixture 5 minutes longer. Notes: Instructions for grinding your own meat in a food processor can be found at http://www.ehow.com/how_2050012_grind-beef-home.html. Super Sloppy Joe recipe belongs to Rachael Ray. Bun recipe by Diana Rattray from About.com with rewritten instructions for clarity purposes. Picture by Laura Flowers. Haha totally sounds like me & Micheal- he can never get enough 'man-food' and would totally love this recipe! I am afraid I must have an inner man that is just dying to get out. I would much rather have the Sloppy Joe than the other options. Not that I don't love a nice quiche - but veggies just aren't my thang. oh man...I haven't had one of these in years. Thanks for bringing me back to those flavors...yum! Yum!! I was just sharing my recipe for sloppy joe's with a friend. The buns looks great, I'll have to give them a try! thankyou fot this I am the aunt of a 14 year old who has lived in the US all his life,and now home in Norway he is homesick for his favorite food,and sloppy joes has been one! Well, you've just made a Sloppy Joe a Gourmet Joe! Yumm! I know just how you feel. My husband talks about his love for bacon and Arby's sandwiches incessantly. He rarely gets to eat either. 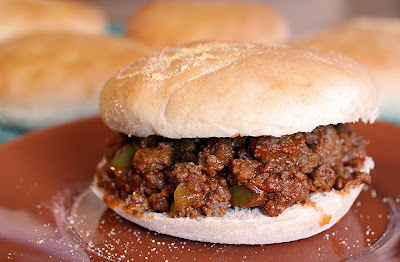 These sloppy joes look fabulous and something my Mr. Persnickety has been asking for and I have never made them. Now I have a recipe! Thanks! Looks fabulous, especially the homemade bun! Mmmm.... I LOVE sloppy joes and have only recently started trying different recipes to make them from scratch! I'll definitely have to give yours a try! These look and sound scrumptious!!! My hubby would revolt if I didn't give him meat every night. I can, on very rare occasions, get away with a non-meat dish like lasagna, just as long as it's loaded with cheese (his idea of a suitable meat substitute)... :). Anyway, you are a better wife than I by making the buns too! Your blog is wonderful and I frequently use it to find ideas for the upcoming week. I just sat down to make this and realized that the brown sugar wasn't in the ingredient list. I Googled the original from Rachael Ray to find out that it was a quarter cup. Just thought I'd leave a comment. Thanks for all the inspiration you've given me. Patrick thank-you for helping me fix this recipe! I sometimes (often) make mistakes no matter how many times I proofread. Thank-you for reading my blog too.